It's the one award I really, really hoped to win someday. Poetry is and always has been my favorite thing to write. I feel deeply honored by the award—and by the company I'm in, which includes many of my favorite poets. 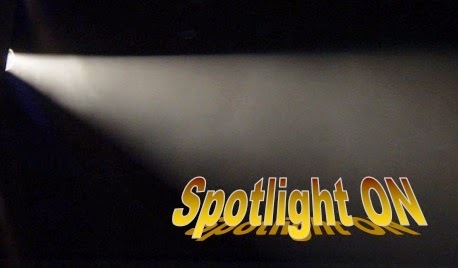 Now it's my turn to feel honored, and thrilled, to welcome Marilyn Singer to the TLD spotlight for National Poetry Month! Marilyn Singer is a big believer in "cross pollination"— supplementing any academic subject with poetry. In this Reading Rockets interview, she explains that poetry "has the power to make the familiar mysterious and the mysterious familiar." 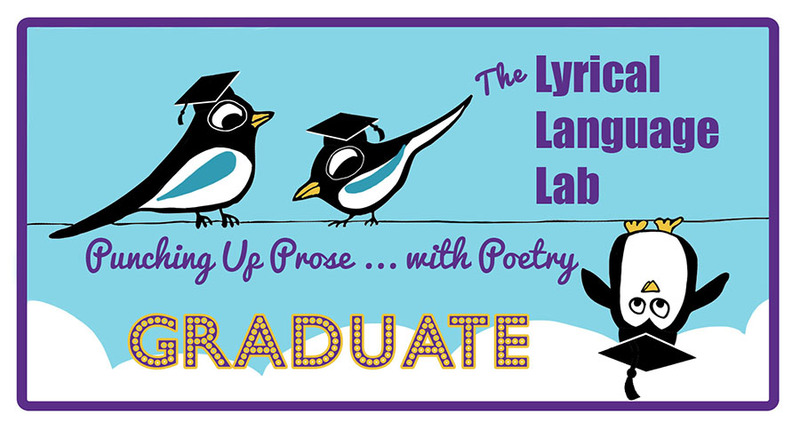 A former teacher herself, Marilyn's 2010 article in School Library Journal, "Knock Poetry Off the Pedestal: It's time to make poems a part of children's everyday lives" lists several ways to incorporate poetry into the classroom. Marilyn Singer is not one to shy away from a challenge. Apparently, coming up with compelling book concepts and formats keeps her from being bored! 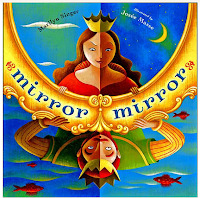 Case in point: her challenging "reverso" poetry form which first appeared in her fairy-tale themed collections MIRROR MIRROR (Dutton Books for Young Readers, 2010) and FOLLOW FOLLOW (Dial Books, 2013). 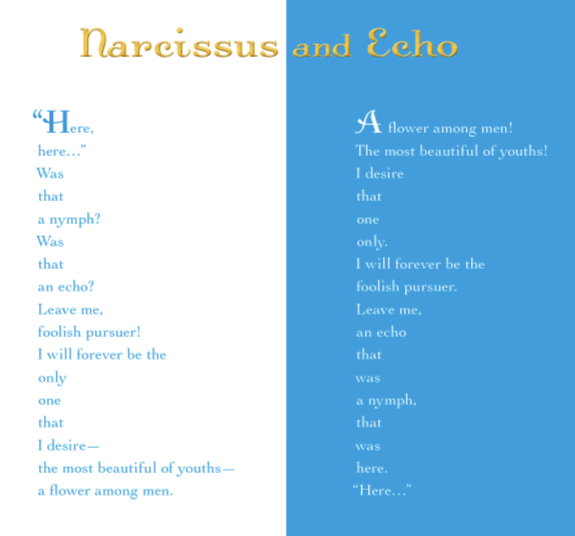 For those new to this form, reversos are poems that can be read forwards or backwards to express two sides of one story. Marilyn discusses the reverso in greater detail later on in our interview. The highly-acclaimed form is back for a third time in ECHO ECHO: Reverso Poems about Greek Myths (Dial Books, 2016). As if I wasn't excited enough just to be interviewing Marilyn Singer, I'm over the moon to be featuring ECHO ECHO. Granted, I've loved Greek mythology since I was a child, but to see these familiar stories being told in such a fresh new way is fantastic! But what if you're not a longtime Greek mythology buff like I am? That's okay! You don't need to be since there is a brief summary of each myth across the bottom of every spread. Marilyn Singer’s ingenious ‘reverso’ poems are child-friendly feats of verbal pyrotechnics. I mean, really, need I say more? Probably not... though I will anyway. The perfect supplement or introduction to Pandora, King Midas, Icarus, and the rest of the bunch of fantastically flawed gods, monsters, and mortals…easy and rewarding to read. The Wall Street Journal described the collection as "delightful...vivid, glowing." And speaking of delightful, vivid, and glowing, wait until you see the amazing illustrations by Josée Masse! Once again, just as she did with MIRROR MIRROR and FOLLOW FOLLOW, Josée Masse provides a feast for the eyes. With a palette of Mediterranean-inspired blues, golds, and greens, the stylized illustrations capture the dualistic nature of the reversos in gorgeous detail. Have a look at this video to see what was involved in making these illustrations come to life! I'm sure I could rattle on about how much I love this book for at least another few paragraphs, but how about we let Marilyn take the floor for a while. Swing dancing, anyone? What is your driving force as a children's author and what aspect(s) of your career do you enjoy the most? I write because I couldn’t stop myself even if I wanted to. I really do enjoy it most of the time, although it is a job and not a hobby. I even enjoy rewriting (at least sometimes) because as a professional, I know it is essential to make the work the best it can be. One of the things I find remarkable about your body of work is that you are prolific across many genres and a broad spectrum of interests. You’ve said that different parts of your personality express themselves in different ways. Do you ever find those interests to be in conflict with one another or in competition for your attention? Well, I never feel that there’s enough time to do everything that interests me—from dancing to birdwatching to going to the theatre to reading to hanging out with friends to, of course, writing. I don’t find these diverse interests a problem in terms of subject matter, though. I like having a wealth of stuff I want to write about. Your first two collections of reverso poems were based on fairy tales. 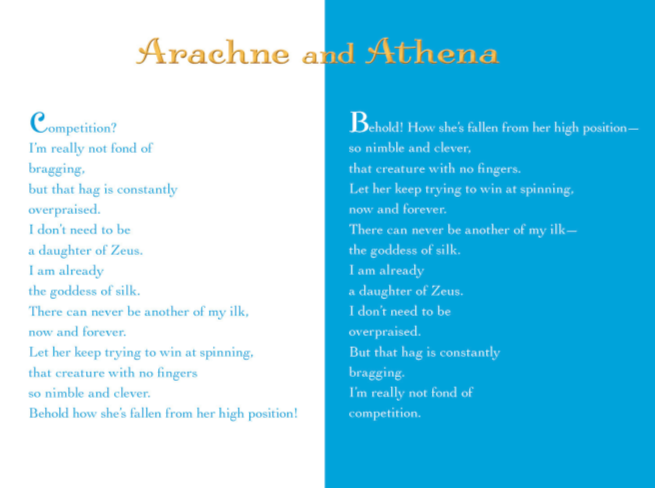 The poems in ECHO ECHO are based on Greek myths. Did the change of subject matter lead to unique challenges in capturing the stories and/or points of view? Were there any myths that simply wouldn’t cooperate? For all three of those books I had to refresh my memory about the fairy tales and the myths, probably more so with the latter. Some of the myths were not PG enough for my book, notably anything having to do with Zeus seducing young women, so I had to leave those out. Some were not well-known, so I omitted those as well. For Follow Follow, my second book of fairy tale reversos, there were several tales that wouldn’t cooperate—“The Fisherman and His Wife” and “The Brave Little Tailor.” I couldn’t figure out a way to have a second voice or point of view in the second half of the reverso, so I never included those. For me, the thought of writing a reverso poem is both exhilarating and daunting. What do you consider the most challenging aspects and can you share any tips about how to piece one together? Hoo, boy, all of it is challenging! A reverso is one poem with two halves. The second half reverses the lines with changes only in punctuation and capitalization and it must say something completely different from the first half. I’d say that making sure that second half says something different from the first is perhaps the most difficult aspect. Text from ECHO ECHO, © 2016 by Marilyn Singer, illustrations © 2016 by Josée Masse. 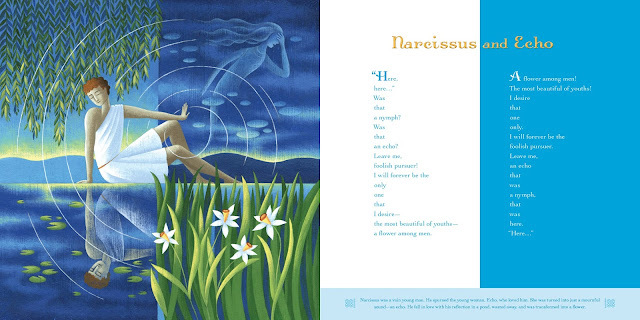 From ECHO ECHO: Reverso Poems about Greek Myths (Dial Books, 2016), text © Marilyn Singer. Find a story, subject, or character with two sides. Start with a few lines that can be flipped so they make sense in reverse. Select phrases that can be turned into questions and interjections. Use a lot of participles, infinitives, and single word sentences. Get to know punctuation—how can you use a comma, period, dash, colon, semi-colon, etc. to change meaning? Write the poem on the computer so you can move around the lines until they make sense. Don’t get discouraged—reversos are hard to write. Play and have fun! Please share a favorite spread from ECHO ECHO and tell us why it’s a favorite. 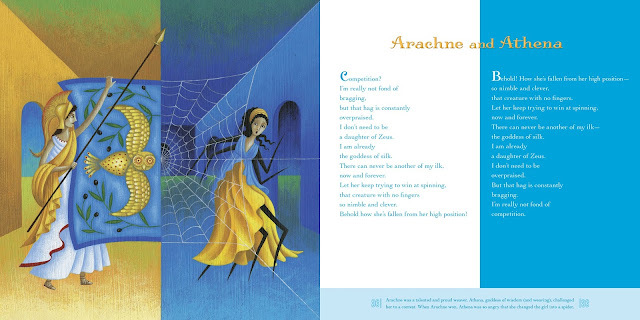 It’s hard to choose—I adore Josée Masse’s extraordinary art in all of the spreads—but I do love “Arachne and Athena.” I’ve often read that poem at presentations because I think it’s a good example of opposing points of view and because it’s fun to perform two kinds of nasty. If you could be any Greek god or goddess for a day, who would you choose and why? I’d like to be Hermes—guide, messenger, healer, and trickster. I like tricksters! Plus he had winged sandals. 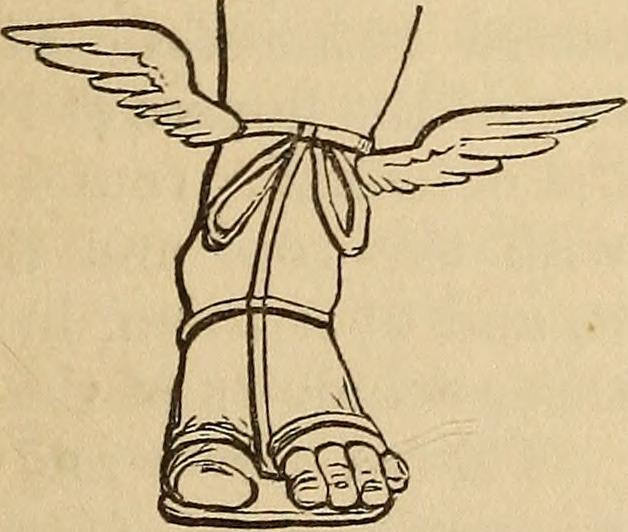 Who wouldn’t want winged sandals? I have three books coming out this fall—Miss Muffet, or What Came After (Clarion), illustrated by David Litchfield, which is a musical without the music about Miss Muffet and her cohorts, and What Is an Apple? and What Is a Banana? (Abrams), illustrated by Greg Pizzoli, which are rhymed picture books about the fun you can have with those fruits. Next year, Dial will publish Feel the Beat! 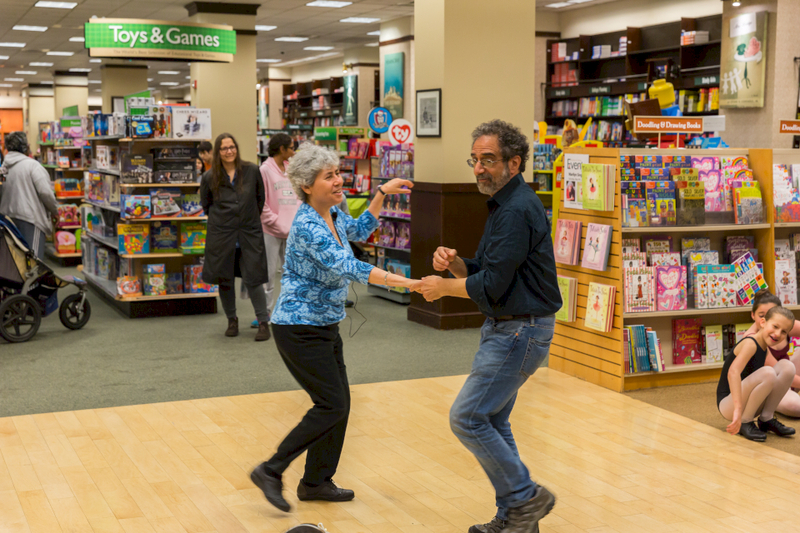 : Dance Poems That Zing from Salsa to Swing, illustrated by Kristi Valiant; in 2018, the following will appear: Tallulah’s Ice Skates (Clarion), my sixth book about a young ballet dancer, illustrated by Alexandra Boiger; Have You Heard about Lady Bird? 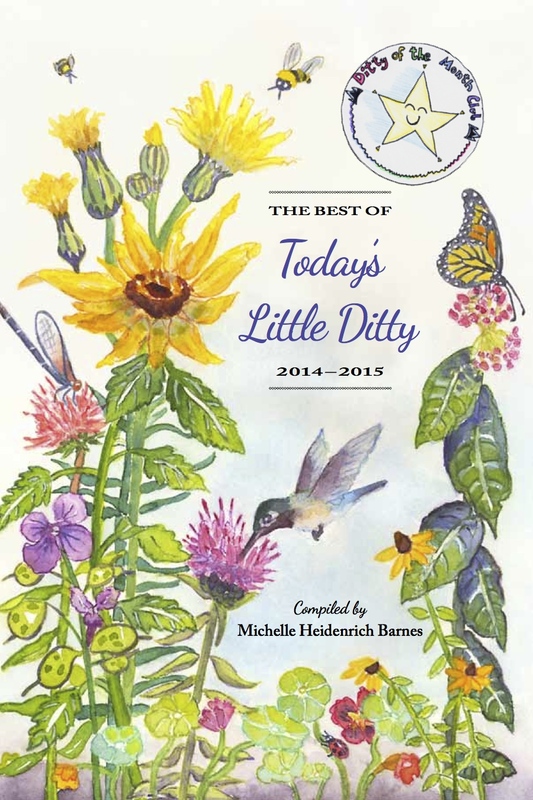 : Poems about Our First Ladies (Disney-Hyperion), illustrated by Nancy Carpenter; and I’m the Big One Now (Wordsong/Boyds Mills), poems about milestone moments for five- and six-year-olds, illustrated by Jana Christy. Keep looking at the world with wonder and joy. I especially love its flexibility since "echo" can be reflected in either form or content. Have another look at "Narcissus and Echo" (above) to see how Marilyn used "echo" in both form and content. But keep in mind, your poem does not need to be based on a myth. Nor does it need to be a reverso, though I expect some of you ambitious types might give it a go anyway. Many thanks to Marilyn for today's interview and to the kind folks at Dial Books for providing me with a copy of ECHO ECHO. I will pass that copy along to one lucky DMC participant chosen randomly at the end of the month. Throughout the month send your "echo"-inspired poems to TodaysLittleDitty (at) gmail (dot) com or use the contact form in the sidebar to the right. Some poems may be published on the blog as daily ditties, but all of them will appear in a wrap-up celebration on Friday, April 29, 2016. Thank you for publishing your poems on your own blogs– I love that! Please also remember to send me a copy of your poem or a direct link to your post. 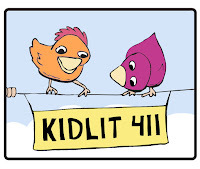 That way I know I have your permission to post your poem on Today's Little Ditty. Thanks again to all forty of you who participated in Amy Ludwig VanDerwater's challenge to write poems about small things. What an incredible collection of poems! We had a small flurry of DMC contributions after the wrap-up celebration was posted, so you might want to go back and take another look. The new poems are by Jane Yolen, Buffy Silverman, Cynthia Grady, Vivian Kirkfield, Leane Gill, and Angelique Pacheco. Random.org has determined that the winner of a personalized copy of EVERY DAY BIRDS by Amy Ludwig VanDerwater and illustrated by Dylan Metrano is . 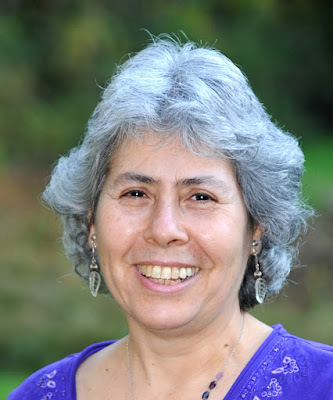 . .
JANIE LAZO — Congratulations, Janie! National Poetry Month is served at last! 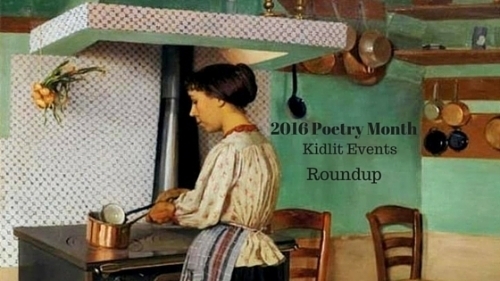 Jama Rattigan is your go-to for the 2016 Poetry Month Kidlit Events Roundup! Find your helping of creative ways to celebrate at Jama's Alphabet Soup. 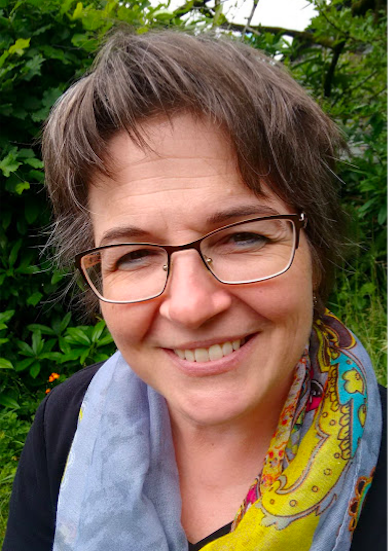 Our favorite keeper of small treasures, Amy Ludwig VanDerwater, is hosting the first Poetry Friday roundup of NPM 2016. 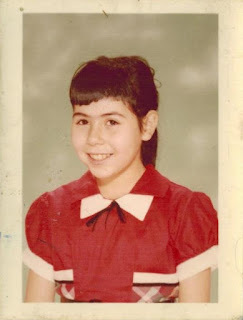 You'll find an introduction to Amy's National Poetry Month project, "Wallow in Wonder," along with links to all of today's poetry goodies at The Poem Farm. What a great interview! I love hearing about curious and creative people. I know exactly what Marilyn means when she says, "I can’t really tell you how I write these poems. I’m not being secretive—I actually don’t know." That's one of the delights about writing (or attempting to write) poetry--to quote Monty Python, "Nobody expects the Spanish Inquisition." Yes! Yes! 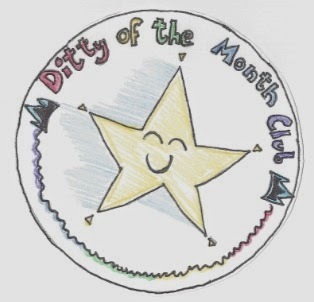 Another month, another brilliant ditty interview and another evocative DMC challenge. Thank you for both; I echo your enthusiasm and esteem for Marilyn Singer! God bless you. 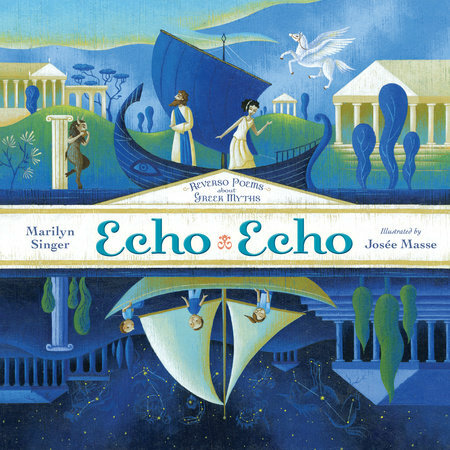 I was expecting this month's challenge to be writing a reverso, so "echo" sounds comparatively easy :-) Marilyn is prolific -- wow! Marilyn is an inspiration. I remember picking up Mirror, Mirror years ago, and shaking my head over it. I wondered how she did it then, and I wonder how she does it now. I bought a copy of it, so my kids could see it, too. I love that you set out the rules, allowing punctuation and capitalization changes. And short lines sounds sensible. I'm still hearing this post echo in my head. Perhaps I will be driven to write an echo poem as so often happens after one of your excellent posts, Michelle. Marilyn is so amazing. I admire her versatility and industriousness, not to mention her clever chops in inventing the reverso! Plus, who wouldn't love a swing dancer who loves show tunes? Definitely huggable. 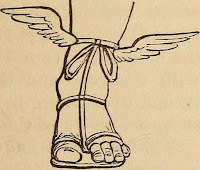 And yes, winged sandals would be the bomb! Thanks to both you cuties for this wonderful Poetry Month treat! 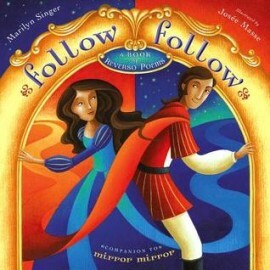 I love Marilyn Singer's reverso books! Some day I may even attempt to write one! Thanks, Michelle! An excellent interview, Michelle. I'm so glad to know that Marilyn has to be in a "certain games-playing frame of mind" to write a reverso. I do have plans for writing one this month. We'll see how that goes. Looks like another fun month over here at Michelle's place! I enjoyed learning about Marilyn and her work. Another "wonder" of an interview and challenge, Michelle. I am in awe of Marilyn's reverso poems, and love reading and re-reading, really studying them. Thanks again for all this wealth to begin April. I'm a huge fan of Marilyn's work. It's just amazing to me how she has the knack for making reverso poems so perfect. I'm a Greek mythology buff for sure. In high school my friends and all chose the name of a goddess to be our nickname as we studied the myths. Of course, being that we were in high school, we all wanted Aphrodite since we all thought we were in love! Thanks for another great interview. 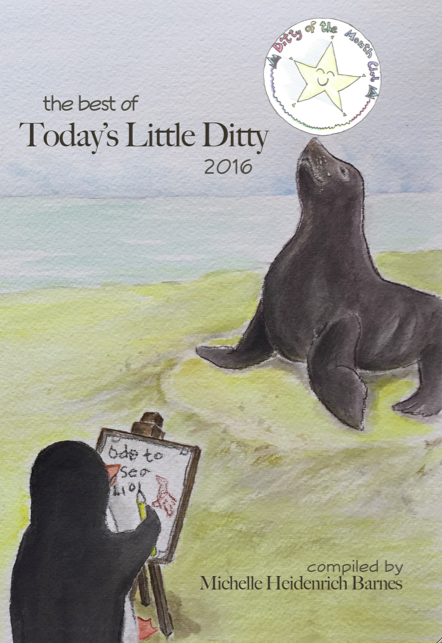 I'm looking forward to reading the ditties! I have been a big fan of Marilyn Singer ever since I read "Turtle in July"--her wonderful collection of animal mask poems. I am so happy that she received the NCTE Award for Excellence in Poetry for Children. She certainly deserves it! Joyce Sidman and Marilyn Singer have both been highlighted in this week's PF Roundup, and, coincidentally, I highlighted their books for my students' choices for our PF celebration yesterday! I'm feeling the love! Can't wait to see what everyone writes for this challenge! Thanks again for another fabulous interview! Fantastic interview, Michelle - thanks to you and Marilyn for this peek into the personality behind such varied and wonderful works! I have favourited this post, which is utterly fascinating... but my favouritest thing is the fact that finally, I wonder if, maybe, a little reverso poem might, one day, be a possibility... Loved how these honest tips quietly empower, when always I have been awesomely overwhelmed. Thank you both for such a fun and informative interview - loved getting to learn Marilyn's process, and so amazed at how prolific she is! I'm definitely going to write something for this month's challenge! Such a great interview, it was so much fun to read! I loved that you included the pics as well as a lot of information about how Marilyn writes. As someone who writes poetry from time to time, I always enjoy reading about other poets. "Marilyn Singer is a big believer in "cross pollination"— supplementing any academic subject with poetry." Exactly how I see poetry in the library and what I do with students.